Come see the giants of Polish rugby in Dublin. 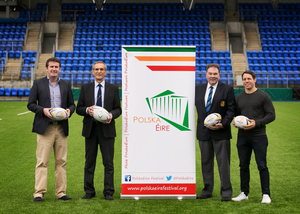 Polish and Irish rugby teams will meet for the first time in history for a friendly match on May 21st, as part of this year’s PolskaÉire Festival. Posted in Misc and tagged Leather Jacket Guy, Poland at 10:27 am on April 29, 2016 by Broadsheet. Ex-Minister of State Aodhán Ó Ríordáin. 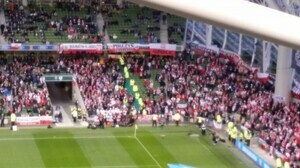 This is not the first time Irish and Polish rugby teams will meet. We went on tour there in 2008 and got wiped off the park by a bunch of muscle bound freaks. I like the green-white-orange-white-red stripes, but what are is the logo supposed to be? That ‘suckers’ song he sings is probably better than every song in the charts right now. He pronounced them not bad! Does the Leather man know his polish? After all, we do have the best beers in the world! Not by a long shot do ye have the best beers in the world. Glad to see polish beers being appreciated in this video. And polish women. 3 two thumbs up. She tastes, she tastes, she taaaastes like the sweat of a beer bottle as she’s held between a Polish woman’s pair a suckers.. a beautiful Polish woman’s pair a suckers… ahhhhh, waaaaahhh, but all women have lovely suckers..especially Polish women, go wan gimme your number.. and you know suckers that just look at cha…. they just bloody look at cha, ta….eat um .. they’ve all a home in Leather Jacket Guy’s heart… me mouth heart.. ja know when suckers just look at cha.. just look at cha.. like traffic lights.. walk all over me.. walk all over me with your tongue.. Suckers I love you, suckers I love you in me arms, suckers I love you in me mouth…. if you are a sucker and you’ve got a sister, come and stay in myyyyyyyyyyyyyyyyyyyyyyyyyyyyyyyyy mouth. Jesus fupping christ on a bike.. Someone didn’t get breastfed enough from mammy. Can’t play the sound on these and now don’t want to. That’s put me right off my tucker. In fairness, you’re supposed to laugh AT him not WITH him really. 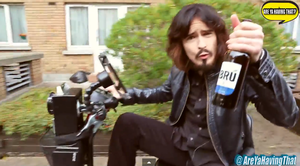 He’s an Ali G-esque parody…..who advertises beer brands. Jaysus you’ll defend any worthless indefensible shoite to the death just to be contrarian, won’t you? Tell us again how great the Luas workers and Paul Murphy are. Who’s us, you absolute space cadet? You stuck with it to 4.46? Can I work where you work? Love the polish beers so much. 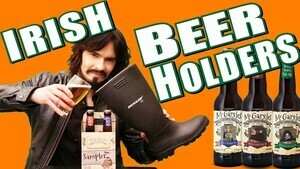 Far better than irish dribbles! May I officially thank the Polish embassy for their touching rendition of “Beidh Aonach Amárach” to celebrate 1916 with us. This guy is kind of like my niece at Christmas when my mother asks her to do a song for everyone. It’s painful to watch and terrible but we humour her because she’s autistic. 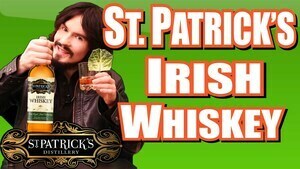 Is it just me, or is this lad just the wrong side of Ricky Gervais divide ? e.g. He prompts me to not laugh at, or with him, but punch him, hard, in the face. And whats with the beard ? looks painted on. Oh yeah Polish beers are very good, and the ladies are very attractive.